Surrounded by the dramatic natural beauty of the Arizona desert and Santa Catalina Mountains, Omni Tucson National Resort in Tucson, AZ, is a sprawling world-class golf resort located just 15 miles from downtown Tucson. 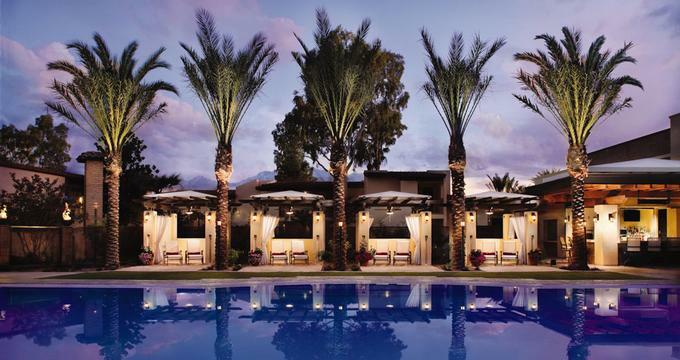 Inspired by the sweeping views of the Santa Catalinas and the rich history of golf, the 650-acre desert resort award-winning desert resort features luxurious accommodations and a wealth of outstanding facilities and amenities to ensure an unforgettable stay. First-class facilities include championship golf courses, a world-class spa, sauna and fitness center, two sparkling swimming pools, and lighted tennis courts while an array of entertainment venues range from elegant outdoor dining terraces and a poolside cabana bar to private function spaces and beautifully manicured gardens. The Omni Tucson National Resort is home to two designer golf courses which have hosted several prestigious PGA Tour events and seen golf legends such as Palmer, Nicklaus and Trevino battle the fairways for glory. 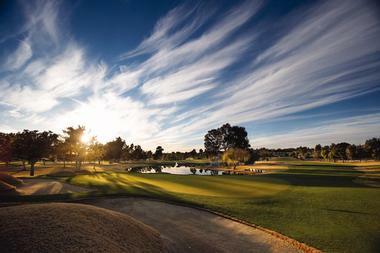 The Tom Lehman-designed Sonoran Course promises a truly dynamic golf experience for golfers of all levels. Omni Tucson National Resort features 128 well-appointed guest rooms, suites, and haciendas, decorated in warm tones to reflect the desert surroundings and furnished with contemporary décor. Guest rooms and suites vary in size and style, however, feature standard amenities throughout, including custom furnishings and artwork, comfortable beds with triple sheeting and feather or foam pillows, walk-in closets and separate vanity areas and balconies or patios. En-suite bathrooms feature showers and/or baths, plush terry robes and deluxe bath products, and added room extra include hair dryers, makeup mirrors, iron and ironing boards and coffee makers with complimentary tea and coffee. In-room technology features flat screen HD televisions with on-demand movies (Mountain Vistas Rooms only), CD players or MP3 clock radios, speaker telephone with voicemail services and high-speed wireless Internet access. All guest rooms, suites, and haciendas boast beautiful views of the surrounding mountains, desert, and pristine golf courses. Classic Traditional Rooms are decorated in warm, desert hues of beige, ochre, and browns, and feature one king, two queen or two double beds and en-suite bathrooms with showers and/or baths, plush terry robes and deluxe bath products. Wooden furnishings are stylish and comfortable, and private patios offer beautiful views over the golf course, swimming pool, and mountains in the distance. Classic Traditional Rooms range from 350 – 950 square feet in size and offer modern amenities such as flat screen HD televisions, CD players or MP3 clock radios, coffee makers with complimentary tea and coffee, speaker telephone with voicemail services and high-speed wireless Internet access. Premier Mountain Vista Rooms and Lofts are spacious and bright, decorated in desert hues of beige and avocado and rich chocolate-brown leather furnishings and offering stunning views. These rooms feature one king or two queen-size beds and private en-suite bathrooms with showers and/or baths, plush terry robes and deluxe bath products. Premier Mountain Vista Rooms and Lofts are 675 square feet in size and are situated within walking distance of the golf club, spa, restaurants and entertainment venues. Modern amenities include flat-screen HD televisions, CD players or MP3 clock radios, coffee makers with complimentary tea and coffee, speaker telephone with voicemail services and high-speed wireless Internet access. 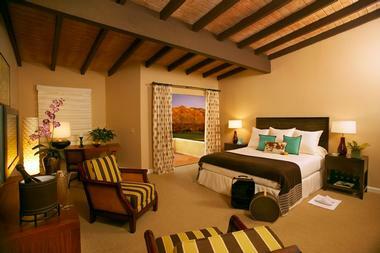 Casitas are 750 square foot residential-style rooms that exude comfort and style. Conveniently located near the tennis courts and swimming pool, Casitas feature elegantly decorated bedrooms with one king bed or two queen-size beds, a sunny sitting area with pull-out sleeper sofa for extra guests, a cozy gas fireplace, and separate dining area. The master bedroom has a private en-suite bathroom with shower, and/or bath, plush terry robes and deluxe bath products and modern amenities include flat screen HD televisions, CD players or MP3 clock radios, coffee makers with complimentary tea and coffee, speaker telephone with voicemail services and high-speed wireless Internet access. Haciendas are southwestern-style accommodations spread over 950 square feet and ideal for families or groups of friends. Haciendas feature a private master bedroom with one king-size, two queen or two double beds and a spacious en-suite bathroom with shower and/or bath, plush terry robes and deluxe bath products. The expansive living area has a pull-out sleeper sofa and cozy gas fireplace, and a fully-equipped kitchen includes a microwave, stove, and refrigerator for easy holiday living. 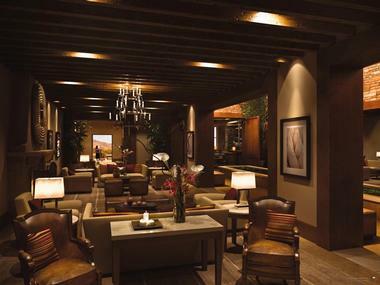 Guests at Omni Tucson National Resort have several excellent dining options from casual drinks and snacks at the poolside Cabana Bar to award-winning cuisine, fine wines and a stylish, laid-back ambiance at Bob's Steak & Chop House. Bob’s Steak & Chop House has been synonymous with excellent steaks throughout Texas for more than 20 years. The award-winning, nationally renowned steakhouse specializes in the finest corn-fed, Midwestern prime beef and serves a simple formula of excellent meat, fresh seafood, crisp handmade salads and decadent desserts. Begin the day with a hearty breakfast from the Fiesta Café as you soak up the beautiful desert sunrise. Combining traditional Southwestern recipes with regional flavors and local flair, the Fiesta Café specializes in ‘The Art of Breakfast’, which is served in the cozy café dining room or on the sunny outdoor terrace. Legends Bar and Grill is located on the 19th hole of the golf course and presents the perfect spot to unwind after a round or to enjoy a few drinks with friends. The sports bar serves an excellent selection of spirits, single malt scotches, and cigars, along with casual club fare. There are flat screen televisions to catch the latest game and a shuffleboard and billiards table for laid-back entertainment. Located next to the stunning infinity edge swimming pool, the Sweetwater Cabana Bar serves a variety of alcoholic and non-alcoholics, handcrafted cocktails, signature spirits, and craft beers, as well as light bar-style fare. The Bar overlooks the swimming pool and the mountains in the distance, and guests can relax on the pool deck or in private cabanas, which features flat screen televisions, lounge chairs, overhead fans, and privacy curtains. 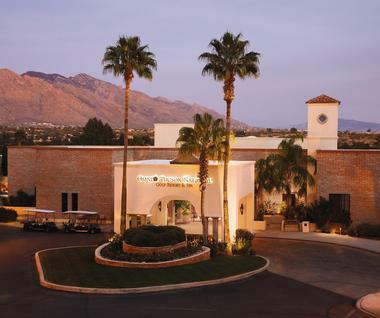 Omni Tucson National Resort offers a wealth of on-site activities and facilities for guests to enjoy, from an exclusive day spa and state-of-the-art fitness center to four lighted tennis courts, sand volleyball courts and two championship golf courses. The incredible desert landscapes offer outstanding bird-watching and wildlife discovery during the day and stargazing in the evenings while the diverse terrain provides the perfect place for fantastic hiking and world-class mountain biking. Hot air ballooning, horseback riding, group cattle drives, desert jeep rides and gold-panning mountain excursions off-site can be arranged by the concierge. 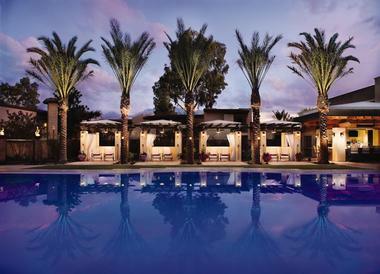 Omni Tucson National Resort’s exclusive 13,000-square-foot spa features luxurious treatment rooms, separate men's and women's relaxation rooms each featuring a sauna and steam room, whirlpool and cold plunge pool, an outdoor swimming pool and relaxation lounge. Spa services include an array of body treatments and massages, face and skin care, and salon services such as manicures, pedicures, hairstyling, makeup application and waxing. Spa guests are treated to bespoke terry robes, spa slippers, and personalized towels. The spa offers seasonal and special occasion packages, including monthly specials, wedding, and honeymoon packages. Omni Tucson National Resort provides a variety of elegant and modern meeting and event venues, alongside luxurious accommodations, outstanding facilities, award-winning cuisine and personalized service. Whether for a business meeting, large conference, team-building event, wedding or reception, the resort has the perfect venue for the occasion. Meeting spaces are embraced by spectacular views of the verdant golf courses and surrounding mountains and many have outdoor terraces for pre- and post-event drinks or receptions. Eight meeting rooms are spread over 10,500 square meters of space, with the largest room catering for 290 standing guests are 230 seated guests, and feature amenities including state-of-the-art audio/visual equipment, on-site technicians, and wireless high-speed Internet. Surrounded by lush lawns and tranquil gardens, the Resort offers a beautiful setting for a desert wedding with stunning views of the Catalina Mountains. Designed for all types of weddings and receptions, from grand to intimate affairs, flexible ballrooms are elegantly decorated with a Southwestern touch. Centrally located and featuring large windows overlooking the Catalina Mountains, the Papago Ballroom is adorned with distinctive regional art and opens up onto a large outdoor terrace. 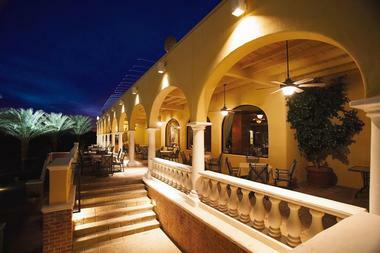 Covering 2,870 square feet, the Papago Ballroom caters for 240 standing guests and 190 guests in a banquet style. The Ironwood Ballroom is 2,652 square feet in size and features large windows and an outdoor terrace overlooking the 19th hole of the golf course and the Catalina Mountains. The Ironwood Ballroom caters for 220 standing guests and 180 in a banquet-style. Located close to the reception area, the intimate Navajo room features a large stone fireplace and caters for 80 seated guests and 110 standing guests. Designed to create an unforgettable Arizona adventure for younger guests, the Omni Sensational Kids program offers a variety of activities, adventures, and games to keep the little ones busy. The program includes a child-size backpack with family-friendly health and nutrition-themed games and goodies to promote healthy eating while vacationing. Goodies include an activity book with healthy snack recipes and fun games, memory match-up cards, crayons, a twisty tomato straw, a kid’s cup with complimentary beverages at all property restaurants and the added treat of milk and cookies delivered on the first night. Back to: Best Things to Do in Tucson, Christmas vacation.